Yesterday was the second edition of the Wine Book Club, and we read about life in Bordeaux. This made me want a Bordeaux red wine in the worst way, but at the same time I didn't want to drink one from France. Does that make any sense? It probably does if you've read Noble Rot. So I looked through my stash of wine and found a Bordeaux-style blend of Cabernet Sauvignon and Merlot that was made Down Under by Greg Norman Estates. It's an interesting bottle because I bought it more than 2 years ago when it was on sale at BevMo for $9.99. I wanted to see whether a wine that cost less than $10 would develop with some short-term cellaring. So I tucked it away, and just opened it, and the results are in: this wine did very well with some cellaring, despite it's low price, and I actually think it could have done with another year or so of shelf time. The 2002 Greg Norman Estates Cabernet Sauvignon-Merlot from the Limestone Coast is a wine that I suspect would fool most drinkers into thinking it was a red from Bordeaux if tasted blind. ($9.99, Beverages & More; if you are looking for this now, expect to pay between $11 and $23) The wine was a nice garnet red in color, with the faintly pinkish brown edges known as "bricking." Usually, bricking is a sign that the wine has some age on it (in this case, 6 years from harvest). Opening this bottle of wine, I smelled aromas of bell pepper, cassis, and a touch of acetate. These are all true to the varietal characteristics, and Old World in style. Flavors of raspberries, blackberries, and a bit of green pepper appeared on the tongue, and there was a smoky aftertaste, with some herbal notes. The wine has a smooth texture--not syrupy by any stretch--and that little bit of glycerin quality that catches the attention of some professional reviewers. Very good QPR. This wine would be much better with food than without. We had it with some grilled Greek-style lamb burgers and a spinach salad. The smoky richness of the lamb went nicely with the fruity core of this wine, and the herbal and pepper notes melded with the spinach and onion in the salad. For under $10, and after 2 years in the cellar, this is a pretty nice wine, and certainly not an Aussie fruitbomb by any stretch of the imagination. I should also note that I put the cork back in it, left it on the counter, and didn't use preservative. Three days later, the wine was smoother, richer, more full of berries, and with less green pepper. This leads me to think it will continue to integrate and improve over the next 12-18 months at least. It will appeal to lovers of Old World style wines, and give those looking for bargain Bordeaux-blends a chance to taste one. And, this wine proves that sometimes wines that don't cost much are still worthy of some short-term cellaring. Have you had any experiences with cellaring inexpensive wines? Please tell us about them in the comments. I used to think I would love to live in Bordeaux. All those vineyards, the old chateaus, the sense of place--where could you possibly imagine living that could measure up to this ancient wine region? Then I read Tim Elliott's selection for the second edition of the Wine Book Club: William Echikson's Noble Rot: A Bordeaux Wine Revolution. Echikson paints a portrait of politics and wine culture in the region that is poised somewhere between bitter family feud, hostile corporate takeover, and prolonged civil war. There are two things at stake in this struggle, no matter how you label it: money, lots of money; and a death match between advocates of traditional and more modern styles of wine making. Among traditionalists, the 1855 Bordeaux Classification is gospel, and pedigree matters. The modernists think Parker is king, employ consultant winemakers, use lots of oak, and pray on their knees for 90+ scores. In the process of describing these relationships, he introduces us to some arresting characters who dot the Bordeaux landscape. Robert Parker, of course, appears and reappears as the story unfolds, tasting wine and setting futures prices that are based almost entirely on whether he pronounced the wine to be good, not so good, or great. So, too, do great winemaking families such as the Lur-Saluces, who have been making wine for a very, very long time. Clan warfare so bitter as to make the Hatfields and the McCoys envious broke out between branches of this distinguished family. The feud started over who should control Chateau d'Yquem, the name of which is synonymous with the ambrosia-like Sauternes made from botrytized grapes that have shriveled due to the fungus known as "noble rot." Inter-generational strife, money, love affairs, broken marriages, back-room deals, shady legal documents--it's all there in the tale Echikson tells about life behind the chateau's walls. All I can say is this would make one hell of a TV series. What I liked best about this book was the spotlight that it shone on aspects of Bordelaise wine culture that we either take for granted or never knew in the first place. I assumed, for instance, that Sauternes had always been fabulously expensive and prized. Not so. Thomas Jefferson ordered 250 bottles of the 1784 vintage of Chateau d'Yquem. Between 1968 and 1983, however, sales of Sauternes and other Bordeaux wines languished. I also assumed that Pennsylvania had the most Byzantine wine distribution system on the planet. Also not so. 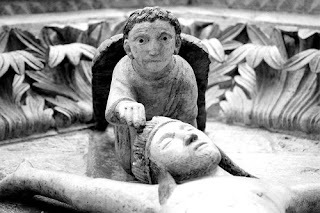 It's Bordeaux, with its middle-men, futures market, and allocations based on previous orders. Ever wonder why you see so much Bordeaux on shelves, even in bad years? Because if you don't order it consistently, you can loose your allocation entirely--which could prove deadly if you're a retailer. Echikson's book will appeal to anyone who likes behind-the-scenes exposes or reality television. There is something gripping and haunting--like watching a train wreck--about watching a group of people engage in self-destructive behavior and bad decision making. You could call this book Survivor: Bordeaux and not be far from the mark. It's great beach reading, plane reading, corporate lunchroom reading, and hammock reading. If you've ever pulled the cork on a bottle of Bordeaux, or ever thought about doing so, you will find this book provides an engaging window into that rarified world. Bordeaux will never be the same for me, now that I've read this book. Thanks to Tim Elliott of Winecast for serving as our host this month. If you're reading this and want to chime in on the discussion, check out the posts on other blogs, the Wine Book Club website, or one of our linked sites on Shelfari or Facebook. Next month's host will announce the title on May 6, and in the end of May/early June look for an inspirational post to keep you turning the pages on the new book club selection from Richard, the Passionate Foodie, about a book that touches on one of his areas of expertise. Once upon a time, four men decided to band together to explore the potential that their favorite grape variety had to display terroir. Often invoked, but still not fully understood, terroir is the ability that a grape has to display the characteristics of the place where it is grown. No two places are exactly the same, and fans of terroir are drawn to the idiosyncratic differences that soil, climate, and other environmental factors can promote in a particular wine. John Buechsenstein, John Ash, Paul Dolan, and Tom Meyer are Sauvignon Blanc fanatics, and they've devoted their company--Sauvignon Republic Cellars--to exploring how this grape performs in California, Chile, France, New Zealand, and South Africa. All four men are not only passionate about wine. 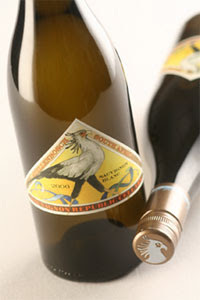 They are also devoted foodies, and are intrigued by Sauvignon Blanc's food friendly ways, too. They think the grape fits the cuisine we eat now, and the flavors of the wine enhance the wide range of spices and ingredients on modern tables. I couldn't agree more--and of course it's a budget-friendly wine option, as well. I decided to pick up their South African example, because I'm less familiar with wines from this region and because I was genuinely curious (fresh on the heels of my experience with a Marlborough Sauvignon Blanc and a California Sauvignon Blanc) to see how different the flavors could be. The 2006 Sauvignon Republic Cellars Sauvignon Blanc Stellenbosch is a jazzy example of what the grape can achieve in terms of distinctive flavors in South Africa. (34 North Wine Merchants, $20; widely available online for between $12 and $20) It was pale in color, though not as clear and almost translucent as most of the New Zealand Sauvignon Blancs I've had recently. Lime and lime zest dominate the aromas and the flavors, giving it an almost Margarita-like intensity. The aftertaste that the wine left in your mouth had a decided strip of jalapeno pepper in it along with all the fresh citrus notes, which was both unexpected and very distinctive. This wine screamed out for chicken fajitas, ceviche, fish tacos, or any other fresh Mexican or Baja fare. I was pleased at how this wine lived up to its promise to deliver an unusual mouthful of Sauvignon Blanc's flavors--especially when compared to the grass, grapefruit, nectarine, and melon notes that I wrote about a few weeks ago--and thought that it was a very good QPR bottling. But if you can get it for $15 or less it would be an excellent QPR find and you should buy it straight away to enjoy with all the vegetables, fish, and poultry that will be on your flavors this spring and into the summer. 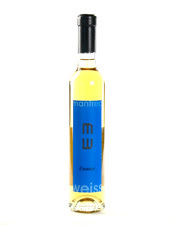 Dessert wines are often likened to nectar because of their sweet, potent flavors and their silky, syrupy texture. I have an orange tree and some enormous lavender in my back yard and since the weather turned warm here in southern California, I've been watching the bees getting drunk on the nectar they are pulling out of all the blossoms. When I walked by the orange tree the other day, there were so many bees drinking from the orange blossoms that you could hear this loud, distinctive buzz. You'll feel like a honeybee yourself if you stick your nose into a glass of the 2005 Weiss Gruner Veltliner Eiswein. I've never had an eiswein--where the grapes literally freeze on the vine before they are harvested--made from the trendy Gruner Veltliner grape, but it was a real treat. I got this bottle as an unexpected birthday gift recently, but you can get yourself a bottle where he picked it up: at domaine547, where it will cost you about $26.99 for a 375ml bottle. This rich wine was dark gold in color, with a bit of peachiness around the edges when it's poured into the glass. The wine smelled of apricots drenched in honey, which was interesting given the peachy-gold color that the wine had. Flavors of jasmine flowers, peach, and apricot rolled around your tongue and made you feel as if you were drinking in jasmine through an apricot-flavored straw. My favorite part of the wine, however, may well have been its caramel aftertaste. This richer, brown-sugared note helped to keep the wine's sweetness in check, as did the core of acidity at the center. A very nice effort, at a very nice price for an eiswein. Very good QPR. As with most dessert wines, I drank it with a simple cookie, in this case some tiny waffle cookies called stroopwaffels. These have the same combination of honey and caramelized flavors I found in the wine, and picked up those notes beautifully. You can usually find bags of them at Trader Joe's, and they're quite good with a cup of coffee, too. That's how they're served in the Netherlands. In general, though, this dessert wine would be fabulous with anything that has brown sugar or caramel, including creme brulee and tarte tatin. Thank you, Patrick, for this great birthday present! Buy yourself a present (even if it's not your birthday) and try a dessert wine soon. It was one of my wine resolutions this year, and even if you're late getting started, make like a honeybee and explore some of these nectared wines soon. Two confessions to start out: first, I don't drink much wine from the Tarragona area of Spain known as the Priorat because they're usually out of my price range; second, I like a good fruit bomb every now and again, and occasionally even a wine that has been manipulated to suit A Certain Palate That Shall Be Unnamed. That's why I decided to write about the 2004 Celler Can Blau from the Montsant DO, which forms a crescent shaped arc of vineyards around the much pricier Priorat DOC. There will be Spanish wine traditionalists who might take exception to my giving this a very good QPR designation, but honestly this is a seriously good buy for those of you who like bold, smoky reds. And if you haven't heard of Montsant, it's an appellation to watch out for if (like me) Priorat wines are often out of your price range. The 2004 Cellar Can Blau is a terrific wine, that is drinking beautifully now. If you have a bottle, I think you might be able to hang on to it for as much as 18 months more, if you are keeping it carefully. The wine was rich plum in color, with decided aromas of smoke, leather, and blackberries. The ripe blackberry aromas continued through onto the tongue, where they seemed at times as if they were dipped in chocolate. The chocolate turned dusty, like cocoa powder, and melded with the bittersweet tannins and smoke of the aftertaste. Like many wines from the region, this is made from a blend of about equal parts of Carignan, Grenache, and Syrah. That's a lot of wine for $12.69, which is what I paid for it in the summer of 2006 at Costco. I can't find it online any more, but I wanted to review it anyway because the 2006 vintage has been released and is in stores now, and seems to have a very similar flavor profile. The 2005 did not, from what I can tell (though I hasten to add I never drank it myself). I'd recommend you but a few bottles and drink them over the next few years. Expect to pay between $14 and $17 for the 2006 either online or at your local store..
Is this wine made for New World Palates? Absolutely. A tad spoofulated? Perhaps. Absolutely delicious? Yes, that too. A bargain? Undoubtedly. Once in a while a chocolate dipped blackberry fruit bomb is a delicious, opulent treat (and most readers probably have a wine that fits into this category, even if they usually prefer something leaner). What will I be drinking tomorrow? I think I'll have a Cabernet Franc to keep my palate on an even kilter. I'm on the road on a business trip, and a friend offered to make me dinner last night. For those of you who travel as part of work, you know that this is like receiving manna from heaven. A night in someone's house, with fresh hot food, and lots of conversation--who could ask anything more, after an endless succession of Starbucks, uninspiring breakfast buffets, and room-service Caesar salads. The subtext for my purchase was this: I finally made it into the Wine Century Club, and there are still more grape varieties out there waiting to be discovered. 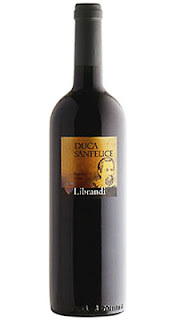 The wine we had was a 2003 Librando Duca Sanfelice Riserva, and it was made with Gaglioppo grapes from Calabria. You might be able to find this wine near you for between $15 and $18. It was a kind of brickish garnet in color, and paler in color than many of the Italian reds that you might be familiar with. It smelled like cherries and truffles (which was excellent, since we were eating risotto with saffron and morel mushrooms) and had a medium, dry body. There were whiffs of tobacco leaf in the aftertaste, which persisted until you took the next sip. The wine was a bit old fashioned, elegant, and streamlined, like an Italian countess of a certain age, and it was terrific with food. This got me thinking about my experiences in the Wine Century Club, of which I am an official new member. First, I think that trying to reach 100 varieties made me fully realize what a wide range of flavors and textures there are in the wine world, and how easy it is to get into a rut where you only have your tried-and-true favorites. There's nothing wrong with favorites, of course--they're your old friends, and for good reason since they're trusty, faithful, and comfortable. But sometimes something new is just right. Second, when you try a new variety like Gaglioppo, you can't help but make comparisons between it and other, more familiar grapes. As I sipped my Gaglioppo I wondered how I would describe it. Is it like Pinot? Like Pinot with a dash of Sangiovese? What about those truffle notes? These comparisons are helpful, but ultimately you end up realizing that Gaglioppo is just exactly like Gaglioppo. Nothing else is quite the same. If you like Pinot or Sangiovese, however, I think you should try Gaglioppo at the first opportunity because you will probably love it. Finally, I don't think I would have chosen the Gaglioppo over the more familiar Chiantis at the wine store if not for my experiences with the Wine Century Club. I am a greater risk taker when it comes to my wine choices. And that's a good thing. A little bit of risk every now and then keeps life interesting, and keeps your wine knowledge and appreciation growing. After 101 varieties, I am reminded once again that one of the reasons I love wine is that there is always more to know. 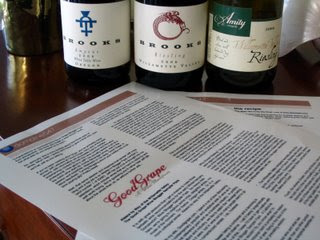 A few months ago, Jeff from Good Grape pulled together a blogger's 3-pack of Oregon wines with domaine547. Jeff promised us a trip to Alsace via Oregon with every sip of these wines. I just opened up my second bottle from the pack, and I think he's delivered so far. The two wines that I've had were both excellent , with distinctive flavors and an attractive price point. The bottle I'm going to focus on today is the one in the far right of the picture: the 2005 Amity Riesling. (purchased as part of a 3-pack from domaine547 for $52.99; the winery is now sold out) Made in the Willamette Valley by Myron Redford, just 100 cases of this beauty were produced. There were pronounced floral, honeysuckle, and orange blossom aromas in this wine that suggested it would be decidedly off-dry when I sipped it. But the wine tasted drier than it smelled, with flavors of lemons and slate. There was a honeyed note in the finish, and a bit of a petrol aftertaste, which kept the wine interesting and engaging. I think it would be hard to find such a well-balanced, complex domestic Riesling for under $20--which this was--so this one earns excellent QPR. This is the kind of wine that begs for spicier food. When you're eating something fiery, it's best to have a wine that's just a bit off-dry but not cloying. We had the Amity Riesling with a Goan Shrimp Curry from the cookbook American Masala by Suvir Suran. The recipe combined aromatic spices, coconut milk, shrimp, and peppers and the wine stood up to if nicely. (hint: if you can't find curry leaves near you, then you can use 2 bay leaves instead. It's not exactly the same, but it will do if you don't have a good Indian grocery nearby) The citrusy notes in the wine were particularly nice with the shrimp, and the floral flavors wafting up from the wine combined with the spices wafting up from the pot. In a few weeks we'll be tasting Old World Rieslings for Wine Blogging Wednesday #45 with Tim Elliott of Winecast, and this wine definitely got me thinking ahead to that event. Rieslings are great food wines, they're lower in alcohol than most whites, and they are perfect for spring time, so go out and find yourself a Riesling. Even if you haven't liked them in the past, wines like this Amity Riesling are going to change your mind. One of my 2008 resolutions was to get to know a bit more about Champagne, and specifically grower Champagne--the kind of bubbly that is made by growers rather than big Champagne houses such as Veuve Clicquot and Moet & Chandon. If you are interested in grower Champagne, the De Long Wine Moment has a terrific article that will explain the difference between the big brands and the small producers, as well as give you an overview of how Champagne is made. The Agraparts are a family of growers who have been cultivating the grapes, making the wine, and bottling their own Champagne since 1894. When the second winemaker in the family, August, died in 1996 at the age of 96, he attributed his long life to drinking a bottle of Champagne a day. Today the fourth generation is doing just what their predecessors did, and all of the grapes produced on the domaine go into their own Champagne. The Champagne region is an area of small villages where Pinot Noir, Chardonnay, and Pinot Meunier are grown. The grapes for this wine come from vineyards in seven different villages (hence the name "Les 7 Crus"): Avize, Oger, Oiry, Cramant, Avenay Val d'Or, Bergeres-les- Vertus, and Mardeuil. Each of these areas is known for particular characteristics, and the blending of grapes from each helps to make the wine complex and distinctive. Avize, for example, is known for the delicacy of its Chardonnay, while Cramant is known for producing wines with fabulous aromas and a caramel taste. 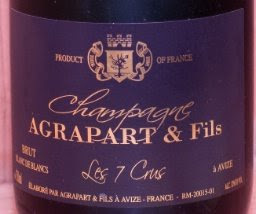 The NV Agrapart & Fils Les 7 Crus Brut Blanc de Blancs was a very good QPR example to start my adventures into grower Champagne. ($34.99, domaine547--but the new bottle has gone up a bit in price to $37.99). Made from 100% Chardonnay, the wine was pale straw in color, with lots of mousse or froth and abundant bead or bubbles when it is first opened. The aromas of warm brioche just out of the oven, fresh lemon zest, and apple welcome you into the glass, where your first sips reveal an open, almost lacy, texture. It was at this moment that I felt I could taste the grapes from Avize and Cramant. The yeasty, bready aromas become more concentrated in the flavors, where the apple turns towards tarter Granny Smith. I did get a slightly caramel, nutty edge to the aftertaste, as well. This wine had great complexity for a Champagne at this price point, and I found it far less assertive and lemony than most of the house style Champagnes I've been able to afford. That complexity may come from the fact that the Agraparts age their Champagne on the lees in the bottle for three years prior to disgorging, which takes place 2 months before the bottles are shipped. If you have any other suggestions of grower Champagnes for me to try, please let me know in the comments section. I've got a lot to learn. Does anyone else remember WBW #34? It was hosted by Catie, the Wild Walla Walla Wine Woman and we were asked to find a Washington Cabernet to drink for the event. As a special request, Catie suggested we try to find something NOT made by Chateau Ste. Michelle--a great producer, to be sure, but she wanted us to experience a wider range of Washington State choices. I went to four stores, came up empty, and ended up drinking Chateau Ste. Michelle. 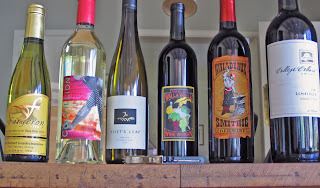 I'm all for Washington wines, but where are you supposed to find them in Southern California? 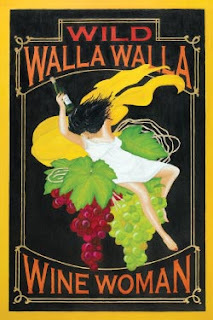 The Wild Walla Walla Wine Woman wants you to drink Washington wine. And to help you, she's opened up her own online wine store with a terrific choice of bottles to tempt your tastebuds. I had my first shopping experience with her just a few weeks ago, and though I haven't tried any of the wines yet, I wanted to urge you to go and see what Catie has on her virtual shelves. I checked out with some Lemberger from College Cellars, an Austrian grape variety that is widely planted in Washington state. Also in my basket were a Sauvignon Blanc with a great story behind it from Couvillion, and a dessert wine from Forgeron made with Gewurztraminer. I bought six bottles in all (full haul pictured at left), and the best part was not a single bottle cost more than $20. For those of you who are interested in a splurge wine, I'd suggest you consider one of the great Washington Cabernets that Catie has in stock, from wineries such as Couvillion, DaMa, and Garrison Creek. Click here for details on all the wines that are available. If you spend more than $100, you will get a free Wild Walla Walla Woman corkscrew made by Rialto. I love mine--it's sturdy enough that I seriously considered using it for a small home improvement project, and it is compact enough to pack in your picnic basket this summer. Thanks to Catie for providing those of us who don't live in Washington state with such a great resource for its wines. I'll be updating you on these bottles after they've settled down a bit from their shipping over the next few weeks. Stay tuned. Behind this black and iridescent pink exterior is a wine that is quite extraordinary. It has quite a following, too, among merchants, bloggers, and readers. This may have to do with the wine's consistency--vintage to vintage people seem to find it rich and delicious. It certainly doesn't have to do with the Aglianico grapes that go into it, since Aglianico is pretty obscure here in the US. And the Molise region where the wines are grown is relatively untraveled, too, by American wine drinkers. Maybe this wine is so popular because the unfamiliarity of the grapes and the region make it an unqualified steal when it comes to the price. I bought mine from Garagiste as a future some months back for $11.95. Now it's on the market for between $11 and $17. 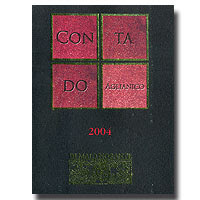 The 2004 Di Majo Norante Aglianico was a beautiful medium-dark garnet in color, although if you pour yourself a full glass expect it to look plummy purple. There were aromas of cherry and earth when the bottle was first opened, and the taste was a bit astringent and drying when I took the first sip and left an aftertaste like strong black tea. One of the readers here, Pat, suggested that I decant the wine first, and folks on CellarTracker seemed to agree, so I decanted it for a little over an hour and the wine had strikingly different aromas and flavors. Where before there had been cherry and earth, I now smelled blackberries, tea, and a whiff of roses. The flavors, too, had changed and now reminded me of blackberry tending towards blueberry--which is to say it tasted like huckleberries to me. There were also tea and sassafras notes, and a little minty lift in the aftertaste. This was a wine that was complex, easy to drink, and a great value--so I think it represented excellent QPR. Aglianico is made for drinking with spicy Italian food, so think pepperoni pizza, sausage tossed with your favorite pasta, or something that uses a bit of chili pepper for heat. We had it with a slightly adapted version of Rachael Ray's gnocchi and chicken meatballs that uses lots of basil and fennel seeds, as well as some red pepper flakes, and the moderate spiciness of the food stood in interesting opposition to the clean huckleberry fruit and the herbal and tea notes in the wine. If you love spaghetti and meatballs but are trying to cut back on red meat, you will love these chicken meatballs every bit as much as the beefy originals. Because this wine changed so much from opening to first sips, and because it was so affordable, I would be tempted to buy a case or half-case of this wine and drink it regularly over the next few years to watch it develop and change. It's lovely now, but I suspect it will continue to improve. I would buy this by the case and drink over the next 4 years. Thanks to Pat, the reader who recommended this wine to me, for suggesting I decant it. This wine is a great value--I highly recommend you try it, too. 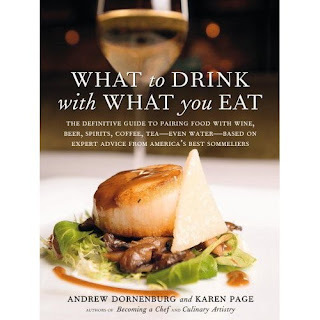 I need to admit that I was really skeptical about Andrew Dornenburg and Karen Page's book, What to Drink with What You Eat. (suggested retail price $35; available new from some retailers for under $24) People can make pairing food with wine such a big deal that they become paralyzed figuring out what the "right" wine is to serve with a tuna fish sandwich. "The definitive guide to pairing food with wine, beer, spirits, coffee, tea--even water" seemed like it would take a bad situation and make it even worse. But I was curious because the book got great reviews and a few major awards, so when the publisher asked if I'd like to take a look at a copy, I agreed. I've now had the book for several months, and it has become one of the most referred to books in my kitchen. Actually, it doesn't stay in the kitchen but lives next to the sofa since I'm always picking it up to get some advice on what foods might go with my latest wine discovery. I highly recommend this book, and think that if you buy it you will find that you use it regularly, too. I'm now convinced that this book is a good thing. First, it avoids the common food and wine pairing pitfall of over-specificity. I read a lot of food and wine pairing that tells you this hamburger must be eaten with this wine, but never tells you why. This book tells you, and gives you a long enough list of foods to go with your Cabernet Franc that it's actually inspiring to come up with a recipe from your collection that fits the bill. Second, the book is arranged so you can start with the food or the wine. If you start with the food you can go for a specific dish (a New Zealand Sauvignon Blanc is the suggested wine to go with McDonald's Filet-o-Fish sandwich, FYI), the dominant spice (cumin goes with Chardonnay), or a major ingredient (try Chablis with avocadoes). If you start with the wine, you will be pleased to find a wider range of grape varieties than the Big Six. They suggest eight different kinds of food to go with Pinotage, the South African full-bodied red, for instance. This section of the book will be particularly useful if you are getting into more unusual varieties and are wondering what to eat with them when you try them for the first time. When I was finishing out my Wine Century I turned to this book again and again to imagine my way into what the wine would taste like, just from seeing the kinds of food they suggested for pairings. My favorite part of the book, however, just may be the "desert island" food and wine lists that the authors draw together from a number of famous chefs. It's fun to see what Piero Selvaggio, the chef from the great LA Italian restaurant Valentino would choose. The Barolo and old Amarone I would have imagined, but not the Nero d'Avola (to be had with the little risotto croquettes known as arancini) or the Lambrusco (to have with salumi). Even if you are a skeptic at first, you may find (as I did ) that this book quickly becomes a regular reference point. If you're looking for a gift for a wine-loving mom or dad in May and June, I'd highly recommend this book. It's thoughtfully laid out, well-written, full of interesting quotes from famous figures in the food and wine world, and provides you with both guidance and freedom to choose the perfect wine for your palate. Still wondering about that tuna fish sandwich? Dornenburg and Page suggest rose. And while you're thinking about books, don't forget to pick up a copy of this month's Book Club selection, Noble Rot: A Bordeaux Wine Revolution and to check out the Winehiker's review of this month's "Spin the Bottle" book, Wine Across America. Temperatures went above 90 degrees this weekend in LA. I know that it may be snowing where you are, but the sun and hot temperatures are coming. When they do, there is no wine that beats the heat more than Sauvignon Blanc. Drinking a chilled Sauvignon Blanc is the gustatory equivalent of laying down in cool morning grass under a lemon tree and being spritzed by a garden hose. Stores are starting to get in their new Sauvignon Blanc releases, and I have two for you to look out for that are made in similar styles but come from different parts of the world. This means that while both are crisp and cooling, they deliver very different taste profiles. Hopefully one of the two will appeal to you and you'll get some in the house for when the summer weather breaks. First up is the very good QPR 2006 Saint Clair Sauvignon Blanc. ($10.89, Costco; $13-$17 from other merchants) This is a classic Marlborough style Sauvignon Blanc from New Zealand. The winery is new to me, and I've already had their Pinot Noir recommended to me by a reader, so it may be that this is one of those names to watch out for in the store as a reliable value producer. It has a typically pale, almost translucent color. Aromas of grapefruit, fresh cut grass, and a zing of lemon zest are consistent with the cool, clear appearance of the wine. The flavors are all across the citrus scale, with a decidedly grapefruity aftertaste, along with some herbal and mineral notes. The wine gets its crispness in part from being fermented in stainless steel tanks at cool temperatures, which helps maintain freshness. Here in the US, the 2006 CrauforD Maroon Vineyard Highlander Sauvignon Blanc from the Napa Valley also goes through cool temperature stainless steel fermentation. ($10/375ml, 34 North Wine Merchants; $13.50/750ml from online merchants) As in the case of the Saint Cloud Sauvignon Blanc, this keeps the wine crisp and fresh. But this example from Napa both the colors and the flavors of the wine are richer, despite the fact that there has been no malolactic fermentation or use of oak. The wine has aromas of stone fruit (specifically nectarine), citrus (specifically lemon), and melon. The color is pale straw, just a shade darker than the Saint Cloud. The flavors are more reminiscent of hay and melon, but the aftertaste is still fresh and crisp. Another very good QPR choice for this summer. Either wine would be excellent with a wide range of summer foods, including salads, chicken grilled with lemon and herbs, or shellfish. Both are perfect for sipping, enjoying with meals, and cooling down in the hot summer evenings to come. I'd hoped to have you a roundup of Wine Blogging Wednesday #44, which was hosted by Gary Vaynerchuk of Wine Library TV and dedicated to French Cabernet Franc. However, no one is exactly sure if there is even going to be a roundup. So the host of Wine Blogging Wednesday #45, Tim Elliott of Winecast, decided to forge ahead announce May's theme. It's Old World Riesling, and Tim wants us to find a European Riesling--any style, any price point--and drink it before May 7. Then, post your impressions over at the Wine Blogging Wednesday site or on you own blog (if you have one). Full details are available on Winecast. Rieslings are affordable, food-friendly wines that are often misunderstood and not fully appreciated. People often say "I don't like sweet wines," and therefore won't try Rieslings, but not all Rieslings are sweet. So go exploring and give them a try. See you back here on May 7 for what promises to be a terrific WBW. Thanks as ever to Tim at Winecast for hosting the event, and Lenn of Lenndevours for dreaming it up in the first place. I'm a big fan of Stelvin closures on wine bottles, also known as screw-tops. They preserve a wine's freshness, you never have to have a reserve bottle in case it's corked, and they make it easier to pack a picnic. There's an increasing amount of good science to back up winemakers who feel their wines are best put under these closures. But they're not very beautiful. 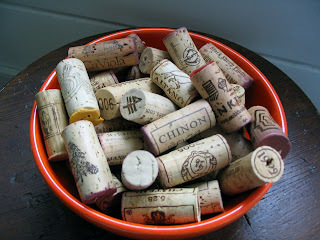 Lately, I've been thinking about the art of the cork. I dumped my latest bowl of corks out on the table the other day, and was struck by how much care went into designing some of them. Can you spot the Twisted Oak in the bowl? Enikidu's Sumerian glyphs? The wolf on Ca' Viola's cork? How about Sineann's Celtic-inspired symbol? The Art Nouveau swirls of Adelsheim? The alchemical symbol from Brooks? 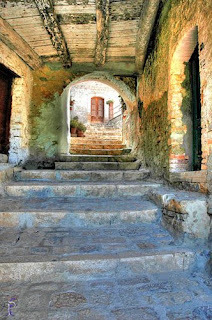 Borgo di Colloredo's tower? I did some sleuthing, and as best as I can tell the reason that wineries first started printing information on their corks was to stop fraudulent brokers from selling sub-standard wine under famous names back in the day when wine was exported and shipped in barrels, then bottled where it was sold. "Bottled at the Chateau" was one way for a buyer to be sure they were really getting the wine that they paid for--not something else that they never expected. Falsifying labels was relatively easy and inexpensive. But printing off fake corks was far more difficult, so corks became the proof positive that the wine you were drinking was genuine. I suspect that's one reason why presenting the corks really got started in fine restaurants--not so you could sniff it, but so you could see that the wine was truly what you had ordered. If there are any sommeliers or WSET diploma students reading this, let me know if this is correct because I'm having a hard time finding proof about this hunch. Today, corks are the part of a wine experience that consumers tend to hold onto the longest--except for the memory of how the wine tastes. The bottle gets put into the recycling, but most wine drinkers have at least one cork in the house. Sometimes it's a champagne cork from a special celebratory bottle. Often it's a cork from a bottle of wine that you loved and want to remember to buy again--so you stick the cork in the drawer and forget all about it. But I realized that I keep the corks just because I find them too beautiful to throw away, and because when I tip the bowl onto the counter and watch them roll around they serve as snapshots of a dinner, a great wine, friends, and family. I can remember (once I see the cork) who I drank it with, what I drank it with, and sometimes what the weather was like. Memories accompany each cork, and to sniff them, hold them, and look at them brings those memories flooding back. Even though I like screw-caps and think wine science is a good thing, I'll be sad to see the day when the art of the cork is no more. Until then, I'll probably continue to treasure my (growing) collection, and marvel at their power to remind me of good times and good wines. 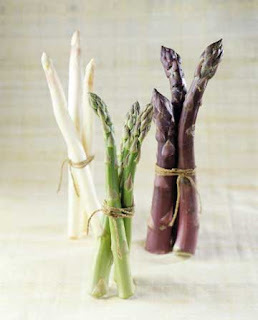 Asparagus is also synonymous with "I'll have water, please" because the vegetable's bitter, vegetal qualities can make it a wine pairing nightmare. It doesn't go with oaked whites, nor does it go with tannic reds. Some people swear by Sauvignon Blanc, but if you get one that's too grassy or tart it can be unpleasant. I was looking through some traditional recipes from Molise, my destination for Italian wines this month, and saw one for an asparagus pasta and wondered if this wasn't a case where "drink local, eat local" might not prove a winning combination. First, I found a slightly easier version of the recipe from Faith Willinger's great book about Italian vegetables Red, White, and Greens, pasta with lemon asparagus sauce. Then I popped open a bottle of Malvasia Bianca from Molise. This solved my annual spring problem of what wine to drink with one of my favorite vegetables. 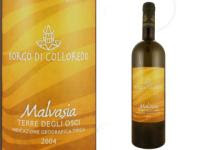 The 2004 Borgo di Colloredo Malvasia Bianca was bright gold in color, and at first I was slightly worried that it had oxidized since it was so much darker than most white wines. I checked some reference books, however, and it turns out that this true gold hue is a characteristic of the variety. I could smell beeswax--like expensive candles, or the waxy aroma of a honeycomb--along with apple and lemon. When I sipped the wine, it felt on the heavy side, and was a nice counterpoint to the toothiness of the al dente pasta. Flavors of apples and lemon dominated, and the finish turned a bit waxy, reminding me once again of honeycomb especially as I swallowed the last bit and the wine left a slightly honeyed aftertaste. I also noted that as the wine warmed up in the glass, the wine became more floral, but in no way sweet. This was interesting wine--more heavy and golden than most whites, yet still dry. I purchased my bottle at Chronicle Wine Cellar for a mere $8.95; if you're not in the LA area, you can find this wine online for about $17. At $8.95, this represented very good QPR, but if you spent $17 you may feel that you paid to much for this unusual, but relatively straightforward and simple, white wine. Once again I'm astonished by the range of Italian whites, and so far haven't had a single one that I wouldn't buy again. Thank you, Molise, for preserving this perfect track record. It's time for a few Wine Book Club reminders. For those of you who don't know, the Wine Book Club was started in January 2008 to give wine bloggers and readers a chance to meet all those New Year Resolutions to read more/learn more about wine. It's also fun to review something that we can all share without shipping restrictions! Our first meeting hosted by David McDuff of McDuff's Food and Wine Trail was held in February, and two dozen bloggers and readers participated. I'm hoping that we'll have as many if not more for our second edition, which will occur on April 29, just three weeks from today. Our host, Tim Elliott of Winecast, picked a fantastic book for the second edition. I've been reading it, and it's a winner. 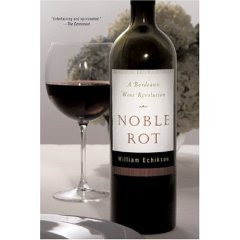 The book under discussion in a few weeks time will be Noble Rot: a Bordeaux Wine Revolution by William Echikson. The blend of history and present-day expose of politics and fashion is truly fascinating. I'm reading Samuel Pepys' diary at the moment, and chuckled when I saw Echikson quote his entry describing Haut Brion from April 10, 1663: "[I] drank a sort of French wine called Ho Bryan that has a good and most particular taste." Don't you wish we still used phonetic spelling for wine labels? Samuel Pepys would clearly have been a wine blogger if he were alive in 2008! My second reminder has to do with keeping your eyes peeled for our latest "Spin the Bottle" review. Sometime in the next week or so, just as your resolution begins to fade, Russ Beebe the Winehiker will post his review of Wine Across America, a wonderful visual tour of wine throughout the United States. I'm looking forward to what this intrepid wine traveler has to say about the book and its contents. Why not join us for the 2nd edition of the WBC? Visit your local bookstore, favorite online retailer, or library and join in the discussion. If you have a "Ho Bryan" to sip while reading Echikson, please let me know and I'll be right over to help you drain the bottle. Quivira Vineyards in the Dry Creek Valley is a representative of what I recently called the Not So Big Wine Life. First they are champions of sustainability, receiving their Demeter Certification in 2005 which recognized their use of biodynamic viticultural protocols. 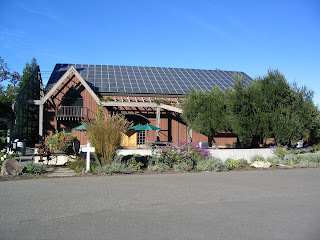 They also received the 2008 Sonoma County Business Environmental Alliance's Best Practices Award for their organic agriculture, use of solar energy (you can see all the panels on the roof), and their efforts to make Wine Creek a safe habitat for fish once again. Second, they also make a not so big Zinfandel: one that is slightly above 14% alcohol, has a good core of acidity, and reminds me of the reds that I drank when I was in my first job and didn't have much money to spend. Then you could get a very drinkable, food friendly Zin for under $10. To be completely fair, it was more than a decade ago. While those prices are getting harder to find, I'm happy to report that it is still possible to find a Zinfandel that doesn't taste like licking a spoon coated with jam, or hit you over the head with its power. The Quivira Dry Creek Zinfandel is not a small wine, but it is a wine that manages to retain a "human scale." Quivira calls their Dry Creek Zinfandel a "melting pot" since it is made from fruit produced throughout the appellation. I think it's more like drinking history. The grapes that go into this wine represent a complete lesson in the Dry Creek Valley AVA. Some of the grapes come from the Standley Ranch's pre-Prohibition zinfandel vines. More come from Quivira's Wine Creek Ranch which has been producing fruit since the 1960s and is now certified organic and biodynamic. Remaining grapes come from Walt Dieden's Ranch and from Quivira's own Anderson Ranch vines, which are Heritage clones. I really liked the 2004 Quivira Zinfandel. I bought this for $20 direct from the winery, which is now sold out of the wine. But it is still available for $18-23. The wine had enticing aromas of black cherry, allspice, and a cedary smell that reminded me of my mother's cedar chest. I liked the way the cherry aromas hung around and turned into the dominant flavor, accented by a rich and bitter taste of baker's chocolate and a shake of pepper. If you get a bottle, expect it to become smoother as it ages and to show more spicy notes of clove and cinnamon and a little less pepper. I think that the wine will continue to drink well over the next 12-18 months if not a bit longer. And, because this wine is very food-friendly and will go with everything from pizza to BBQ to a spicy chili without making a fuss, you won't have any trouble finding something to serve with it, whenever you choose to pop the cork. This very good QPR Zinfandel feels and tastes old fashioned--maybe even historic--and restrained, just the way I like them now and and remember them way back when. Back when Zinfandels were not so big, but every bit as delicious. Wine & Spirits magazine is coming to LA this May to unveil some of their critics' "Hot Picks" for 2008--the wines that stand out from a year's worth of wine tasting because of their accessibility, affordability, and delicious taste--and to celebrate some of the city's youngest sommeliers and wine experts. For $75 you will be able to meet and mingle with some savvy people under 35 who are already making a name for themselves in LA's wine scene, and taste some of the wines that will be featured in the June 2008 issue of the magazine just as it's hitting the news-stands. The event will be held in the inspiring MODAA Gallery in Culver City, and since space is limited I'd advise you to book ahead. Save the date (May 22, 2008, 7-10 pm), reserve tickets for you and your friends, and join me at this great event. A portion of the ticket sales will benefit the Surfrider Foundation, so you can drink delicious wine while supporting water conservation issues (something that should be on everyone's mind in Southern California). Not in LA? The Wine & Spirits Drink Wine, Save Water event moves to Seattle's Paramount Theatre on June 24, 2008, so maybe you can catch them there. I will be at the MODAA Gallery on May 22, and I hope to see many LA readers of GWU$20 at this event featuring great wine values, and benefiting a worthy cause. This month, I'm going to be focusing on Molise and its wines. Sometimes, people lump the wines of Molise in with the wines that come from their better known neighbor to the north, Abruzzo. Since 1963, however, Molise has been its own province, and it seems only right to consider their wines on their own merits. 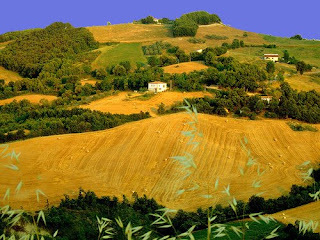 Located just below the calf of Italy's boot, Molise and its wines have been relatively overlooked by tourists and consumers outside Italy, which is a shame because it is drop dead gorgeous if the pictures are to be believed. If the wines are half as delicious as the scenery, I am in for a treat. Though Molise's wine history stretches back so far that Pliny the Elder wrote about it in the 1st century, it can be hard to find modern examples of the wines in the US and most of Molise's wines are consumed in Italy. Recently, the wine firm Di Majo Norante has imported more Molise wine into the country, and if you've had wine from Molise you have probably had one of their bottlings. This month I'll be trying a Di Majo Norante red wine, but I'll also be opening up a white wine from the Terre degli Osci IGT. And I still haven't given up hope that I'll get my hands on a dessert wine from the area. While the wines may be hard to find, they can represent excellent value when you do, since the region doesn't conjure up the wine cache of Tuscany or some of Italy's other well-known growing areas. It's time for the April edition of Wine Blogging Wednesday, Lenn Thompson of Lenndevours' online tasting event. This month, our host is none other than Gary Vaynerchuk of Wine Library TV. Gary is a well-known Cabernet Franc fan, so he asked us to drink a French Cabernet Franc. This led to the usual frazzled searching as folks scrambled to get their hands on the perfect wine. I let domaine547 do the searching and I just did the buying. I ended up with a great example of the grape. Cabernet Franc is a grape that many people drink in Bordeaux or Meritage blends without even knowing it. It's often mixed with Cabernet Sauvignon, as it has less acid and contributes peppery and flowery notes to blended wines. Cabernet Franc is one of Cabernet Sauvignon's parents--its other parent is Sauvignon Blanc--and its resistance to cold temperature and rain makes it a popular grape in regions that experience harsh weather. Today, it is grown not only in France, but also in Italy, Australia, Canada, Hungary, Spain and the US. The grape is especially popular in the Loire valley, where it has been cultivated since at least the 1700s (and probably even longer). Domaine Noblaie, the maker of my wine, combines the best traditions of the Loire with the best new wine-making and cultivation practices. The hillside where the grapes are grown in the Chinon AOC have been producing grapes for four centuries. The grapes that go into this wine come from 40-80 year old vines. Francois Billard, a former viticulture professor, owns the operation. And his 24-year-old son, Jerome, makes the wine. How's that for mixing up tradition and change, history and the promise of the future? And that promise is delivered in the 2004 Domaine de Noblaie Les Chiens-Chiens. It was, quite simply, the most enjoyable Cab Franc I've ever had. ($15.99, domaine547--and sold out, but the 2005 is in stock; 2004 available elsewhere for between $16 and $19) Not everyone is a fan of Cabernet Franc, but this wine really convinced me that there are good, affordable options out there for you to try. When you open this bottle, its smoky, vegetal, and red fruit aromas combine nicely. No one aspect of the aromas dominated, but you could definitely detect each individual feature. I found the same elements--smoke, bell peppers and herbs, and red fruits--in the flavors as well, and the wine turned more and more smoky in your mouth as you swallowed it. The wine had a medium body, and a nice texture in the mouth, managing to seem both airy and substantial at the same time. I drank the wine over three nights, and the wine's vegetal aromas and flavors grew less pronounced each night indicating to me that some of these more assertive characteristics may soften in time. That said, this was a delightful wine to drink now, and represented excellent QPR. Cabernet Franc, in my experience, is a wine that is at its best with food, and this wine was no exception. The Les Chiens-Chiens' smokiness made it especially well-suited to BBQ (we had it with BBQ chicken and it was excellent). If you like the wine's vegetal apsects, however, make yourself a peppery pasta to go with it. Boil some farfalle until al dente (about 10 minutes), and drain it, reserving 1/2 cup of the cooking water. Then toss some chunks of green and yellow pepper in a saute pan with chunks of red onion and some olive oil and saute them for about 5 minutes until tender. Remove the peppers from the pan, and add a touch more oil and 2 sliced garlic cloves. When you smell the garlic, toss in a pint of halved grape tomatoes, a pinch of red pepper flakes, and some pepper. Cook for about 3 minutes more, squashing the tomatoes slightly to release their flavor. Taste it for seasoning, and add salt as required. Then add the vegetables back into the pan along with the tomatoes, add the pasta and the reserved cooking water, and cook for a few more minutes until the pasta is tender and the juices have thickened and coated the pasta. If you have some leftover cooked sausage, cut it on the diagonal and throw it in with the vegetables to heat it through, too. Top with your favorite cheese and enjoy with your Cabernet Franc. This recipe will really bring out the peppery, smoky, and fruity qualities of the wine. Cabernet Franc may be an acquired taste, but once you're hooked, you're hooked. This wine did more than any other I've had made by with the variety to help me get what all its fans cherish about it, since it managed to be fresh and smoky as well as fruity and vegetal. Thanks to Gary Vaynerchuk for a great theme, and as always you can check back here in a few days for links to what promises to be an epic roundup of tasting notes from bloggers, readers, and other Vayniacs--as well as the announcement from Tim Elliott of Winecast regarding WBW #45.